Jervas painted Swift twice, in London 1709-10 and in Ireland 1718-19. NPG 4407 is a version of the first type. 1) H. Williams ed., Swift, Journal to Stella, 1948, pp 9, 13-14. 2) Ibid., p 71. It is not known what happened to this idea. 3) Mrs R. L. Poole, Catalogue of Portraits in the possession of the University, Colleges, City and County of Oxford, I, p 98, no.246; Catalogue of Portraits in the Bodleian Library by Mrs R. L. Poole completely revised and expanded by K. Garlick, 2004, p 299; exh. Second Special Exhibition of National Portraits ( ... William and Mary to MDCCC), South Kensington, 1867, no.140. 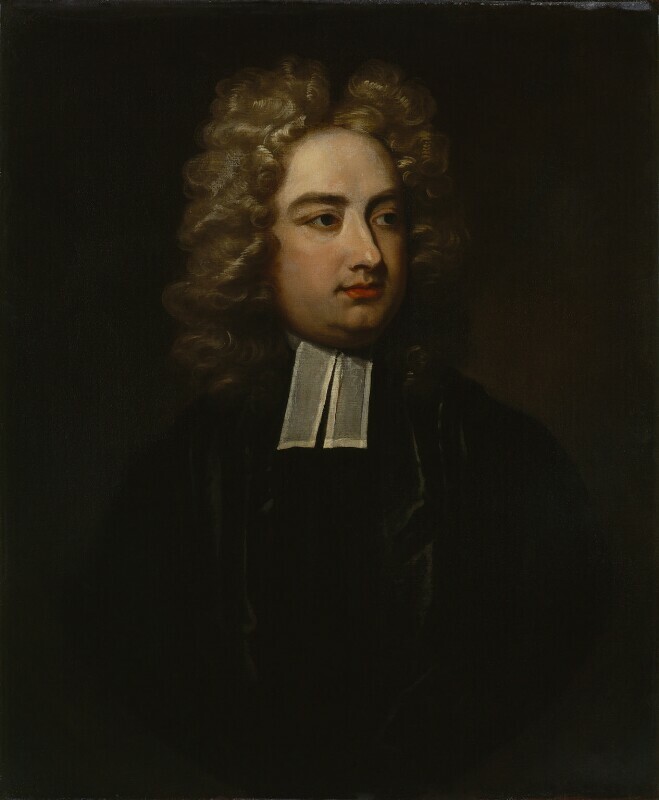 William Richardson told Swift (10 April 1739) that ‘Mr alderman Barber made a present to the university of Oxford of the original picture done for you by Jarvis … [but] first a copy was taken’ (H. Williams ed., The Correspondence of Jonathan Swift, 1963-65, V, p 143). Barber owned the portrait by 1723-24, see NPG 258. 4) C. J. Phillips, History of the Sackville Family, 1929, II, p 426. 6) D. Alexander, ‘George Vertue as an Engraver’, Wal. Soc., LXX, 2008, no.157. In a letter datable October 1714 Jervas told Pope ‘I intend this day to Call at Vertue’s [to] see Swift’s brought a little more like’ (Pope, Corr., I, 1956, p 262). F. R. Falkiner, ‘Of the Portraits, Busts and Engravings of Swift and their Artists’, in The Prose Works of Jonathan Swift, XII, 1908, pp 5-6. Complete Illustrated Catalogue, NPG, ed. J. Simon & D. Saywell, 2004, p 601. The Earls of Lonsdale; Lowther Castle sale, 2nd day, 3rd series, 30 April 1947, lot 1939 (as Swift, school of Kneller); bequeathed by Sir Harold Herbert Williams (1880-1964)1 1964. 1 Kt. 1951, literary scholar, editor of Swift’s Journal to Stella 1948 and Correspondence 1963-65. Le Livre anglais, Bibliothèque nationale, Paris, 1951; Voltaire, musée de l’Ile de France, Château de Sceaux, 1978; lent to Government offices 1978–79.